NOW OPEN: Imperial Vale Station is the site of Imperial Bar and Bistro which is run with the help of the Lowe family. A NEW business at Mount Tom is continuing the legacy of a boy gone too soon. Two years ago, Therese and Will Lowe lost 13-year-old son Dempsey in a tragic accident. On Monday, the family's friends of 27 years Mary Briggs and Ian Sharp opened Imperial Bar and Bistro to carry out Dempsey's vision, which was to see more jobs for young people in the region. 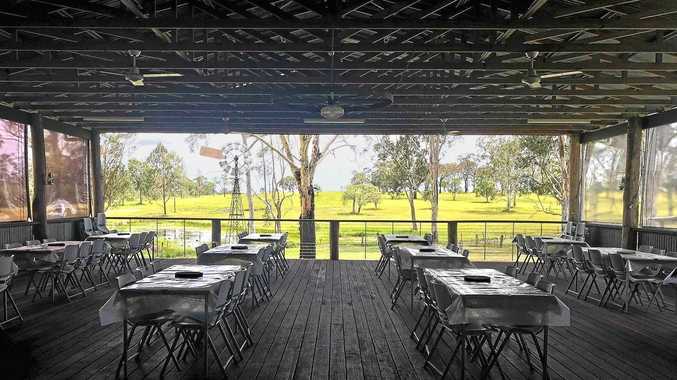 "He wanted this sort of venue that we've got here to be making the rural industry more productive for young people looking for work,” Ms Briggs said. She said the venue had already employed 10 people including Mr and Mrs Lowe, 17-year-old daughter Kianna Lowe and some "long-term unemployed” locals. "Ian and I put everything up ourselves, we established it ourselves. It's a big property, nearly 300 acres 9120ha) and we designed it as a woolshed design,” Ms Briggs said. Mrs Lowe said Dempsey and Kianna were both involved in the farm long before the restaurant started. "This was Dempsey's legacy so we want it so succeed, this was my son's goal,” Mrs Lowe said. "He could see the way the town was going, it was going down and he loved being in open spaces and couldn't think of anything better, why not utilise it when we've got this beautiful view. The farm at Imperial Vale Station is a 20-minute drive from Agnes Water, 15 minutes from Miriam Vale and 45 minutes from Bundaberg. "A lot of history in this place, it was an old homestead they revamped and they're trying to bring it back to the way it was before,” Mrs Lowe said. Imperial Bar and Bistro is at 2301 Fingerboard Road, Mount Tom and is open every day 8.30am-4pm.